It’s been over 2 years since the current version of ampproject.org launched, just before the very first AMP Conf in early 2017. Since then the AMP Project has grown a lot and launched entirely new applications of AMP on the web like emails and stories. Additionally AMP resources were scattered across multiple websites like ampbyexample.com and ampstart.com. So we decided to bring everything together into something new, better organized and easier to use. To bring all of AMP under a new home, we’re thrilled to announce amp.dev! 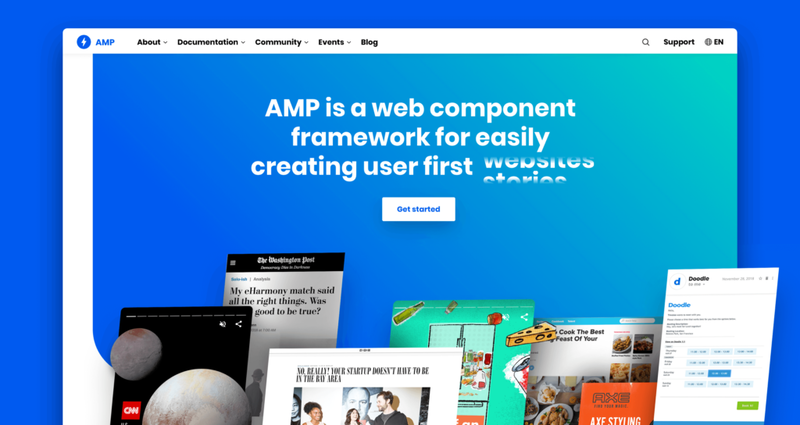 The all-new amp.dev will replace ampproject.org in order to provide developers (and their business counterparts) everything they need to know about AMP across all its various forms. And of course, it’s built entirely with AMP, using AMP optimizer to make the site load even faster when not served from a cache. All of the existing ampbyexample.com resources, as well as the templates on ampstart.com, have been migrated and integrated into various sections of amp.dev. We also have new sections like Use Cases, where you can find a gallery of different possibilities of creating with AMP. While this section only as a few items at the moment, it will continue to grow in the coming months. For a brief time we’ll be leaving AMPproject.org up to allow for a smooth transition to the new site. However, in the near future, we’ll be setting up redirects as we begin to turn down AMPproject.org. For now, we have banners on each site to indicate the upcoming change. The blog (what you’re reading now) has already moved to blog.amp.dev.